STEVE ATKINS 2253 Whitfield Wangaratta Road, Docher VIC 3678. Mobile 0429 237 073. ANTHONY AZZOPARDI 954 Muckleford-Walmer Rd, Walmer VIC 3463. Ph 03 5475 1103, Mobile 0417 554 492. BRIAN BONDE 9 Keppel St, Yeppoon QLD 4630. Ph 0417 545 039. PETER BOOKLUCK 270 Tripp McDonald Rd, Nilma North, VIC 3821. Phone 0427 432 319. JOHN BREARLEY PO BOX 594, Warwick, QLD 4370. Ph (07) 4667 3808 (h), 0428 987 922. IAN BROWN 110 Priestley’s Rd, Birralee TAS 7303. Phone (03) 6396 1268 or 0418 132 229. BRAD CAVANAGH 718 Reedy Creek Road, Kingaroy QLD 4610. Mobile 0428 176 062. DON CHILDS Phone 0417 854 553. JIM DIX PO Box 132, Taroom QLD 4420. Phone (07) 4627 3300. DARRELL EDWARDS Soldier Settlers Road, Nangus via Gundagai, NSW 2722. Phone 0400 905 038. PAUL EMERSON 43 Meyers St, Bearii VIC 3614. Phone 0439 897 969. BRIAN FISH PO Box 90, Oatlands TAS 7120. Phone (03) 6254 1149. KAREN FISH Snr (timed events only). 49 Tullamore Rd, Orielton, TAS. 7172. Phone (03) 6265 2309. EDDIE FISHER 387 Paynters Creek Road, Nambour, QLD. 4560. Phone (07) 5476 4424. CRAIG FISHER PO Box 20, Marrar, NSW, 2652. Phone 0437 059 271. STUART FRAME 391 Glenvalley Rd, Monto QLD 4630. Phone 0411 100 702. GRAEME FREUND 23 Peake St, Mount Gambier SA 5290. Phone 0428 516 762. GEORGE FRUIN 374 Churchill St, Warragul VIC 3820. Mobile 0427 714 516. JOHN P GILL PO Box 61, The Rock, NSW. 2655. Phone (02) 6920 2391. JAYNE GOOD (Flag Judge), 99 Mannings Jetty Road, North Motton, TAS 7315. Ph: 0448 386 010. ALLEN HEATH PO Box 63, Roseworthy SA 5371. Phone (08) 8524 8184 or 0438 084 639. BARRY JONES 127 Cleary St, Warwick Q 4370. Phone 0427 782 741. SHANE KENNY P.O. Box 2291, Emerald QLD 4720. Phone 0429 727 108. TOM KENNY PO Box 1468, Emerald QLD 4720. Mobile 0417 076 419. BRIAN LAWLESS Towra, 4610 Gundagai Rd, Cootamundra NSW 2590. Phone 0417 230 219. ANTHONY LILLYMAN Longview Station Richmond QLD 4822. Phone 0427418524. GARRY LONGNEY Phone 0421 417 832. BRIAN LOVETT PO Box 369, Taroom QLD 4420. Phone 0427 366 813. BRUCE MARSH 394 McGuigans Road, Millbrook Vic 3352. Phone 0418 139 740. ALAN McKENZIE Phone 0427 346 934. ROBERT McPHEE Phone 0487 189 810. JEFF MILLER 353 Upper Wheatvale Rd, Warwick QLD 4370. Ph 0439 669 111. BRIAN NILSSON PO Box 9178, Mt Gambier West, SA 5291. Phone: 0408 154 218. TERRY O’NEILL 102 Williams Road, Caboolture, QLD 4510. Mob. 0417 078 615. JIM PIERCE Passchendale, Tooma, NSW. 2642. Phone (02) 6076 8237. NEVIL REED ‘Halfway’, 338 Foursprings Road, Selbourne, TAS 7292. Ph (03) 6396 6160. MAVRYN REMFREY PO BOX 211 WINTON QLD 4735. Phone 0437176667. JOHN ROBSON 56 Porter Rd, WARWICK, QLD 4370. Ph: 0407 615 802. LINDSAY ROSETTA 2010 Mayrung Road, Mayrung, NSW 2700. Phone 0428 200 171. ADRIAN SCLANDERS PO Box 1207, Golden Grove SA 5125. Phone 0419 147 631. ALAN SIMPKIN Seymour Road, Nar Nar Goon, VIC. 3812. Phone 0408 324 695. DAMIEN VINEY PO Box 586 Ulverstone, TAS 7315. Ph 0455 273 756. IAN WATKINS 10 Gleeson Close, Gracemere, QLD 4702. Phone 0448 341 700. TROY WELSH PO Box 627, Beaudesert, QLD 4285. welshsaddle@bigpond.com M 0427 101 511. JIM WILLOUGHBY RMD 18 TRURO SA 5356. Phone 0427795192. GAVIN WOODALL 2506 Princes Highway, Heywood Vic 3304. Phone (03) 5527 1536. BONNY YOUNG PO BOX 219 HIVESVILLE Q 4702. Phone 0429 434 291. NOEL FRASER (All Stock, Portable Arena Complex) PO Box 276, Wilmington, SA 5485. Phone (08) 8667 5274 Mob: 0488 725 212. JOHN P. GILL (All Stock, Portable Arena Complex) PO Box 61, The Rock, NSW 2655. Phone 0417 017 236 or (02) 6920 2391. 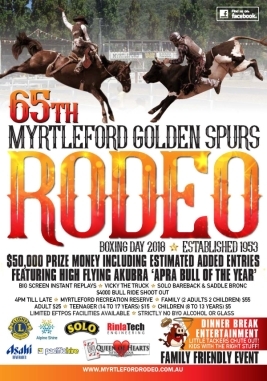 GARRY McPHEE (All Stock, Portable Arena Complex) 165 Gardiners Rd, Lurg, VIC 3676. Mobile (04) 2879 4464, ph. (03) 5766 4237, Fax (03) 5766 4266. RON WOODALL AND SONS (All Stock, Portable Arena Complex) 375 Lyons Hotspur Rd, Lyons, VIC 3304. Phone (03) 5528 4224, Fax (03) 5528 4206, Mobile 0419 373 543. FRANK BIDDLE (Bulls only) PO Box 42, Warwick QLD 4370. Phone 0407 149 198. DARREN BRANDENBURG (Bulls & Timed Events) PO Box 199, Clermont QLD 4721. Mob: 0428 268 597. MATT BUSBY (Horses only), 196 Canoona Road, M/S 1307 via Old Nine Mile Road, Rockhampton, QLD 4700. Phone 07 4927 0337, Mobile 0408 454 674, Fax 07 4922 4466. ROBERT McPHEE (All Stock and Portable Arena Complex) 537 Hallorans Road, MIRIAM VALE, QLD 4677. Phone 0487 189 810. MC RODEO COMPANY (Bulls and Portable Arena) Mick Wyllie, c/- Post Office, Gawler, Tasmania. Phone (03) 6429 1339, Mobile 0409 213 351. JACK O’CONNELL (Junior Pony Buckjumpers, Open and 2nd Division Bucking Horses) RMB 860, Drovers Rest, Thyra Road, Moama, NSW 2731. Ph: 03 5889 5145, Mobile 0428 505 486. TERRY O’NEILL (Timed Events Only) 102 Williams Road, Caboolture, QLD 4510. Mob. 0417 078 615. 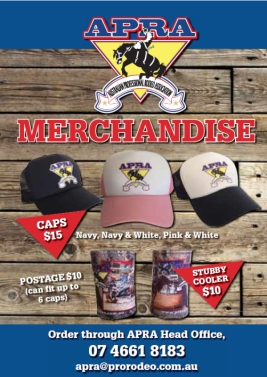 A & J REMFREY RODEO COMPANY (Broncs, Bulls and Timed Event Stock) PO Box 263, Cloncurry, QLD 4824. Phone 0417750189. WADE NICHELE 1050 The Great Alpine Hwy, Tarrawingee, VIC 3678. Phone 0408 513 242. ALEXANDER WHITE 106 Bangalee St, LAUDERDALE TAS 7021 Ph: 0409755076. LARRY CANN 21 Dioth St, Yarraman QLD 4614 Phone: 0428 221 579. CHRIS HOCKING PO Box 232, Mundubbera QLD 4626. Phone 0412 942 045. TERRY MURRAY 13 Dymock Dr, Goonellabah, NSW 2480. Phone 0418 214 626. RUSSELL GREEN 978 Great Alpine Rd, Tarraroo, Tarrawingee VIC. Ph: (03) 5725 1857 or 0418326 439. TONY WOODALL 5601 Princes Highway, Winnap, VIC 3304. Phone (03) 5528 1490. MICK BATCHELOR Norwood, Grong Grong, NSW 2652. Ph (02) 6956 2120 or 0427 262 027. STEVE BRADSHAW “Old Glenelg” 109 Middle Creek Road, Maules Creek via Boggabri NSW 2382. Phone 0428 250 585. LAMAR COX Hann Highway, Hughenden, QLD 4821. Phone (07) 4741 1714. ALLEN HEATH PO Box 63 Roseworthy SA 5371. Phone 08 8524 8184. ADRIAN IRELAND PO Box 68, Casterton, VIC 3311. Phone 0429 121 202. ROD JONES AND TEAM “Red Side” Melton Mowbray, TAS 7410. Phone (03) 6259 1125. PETER KELLY ‘Currangandi’, Upper Horton, NSW 2347. Phone (02) 6782 7240. GENE McDONALD Phone 0409 965 641. DAVID MESSENGER 26 Fifth Ave, Scottville, QLD 4804. Phone (07) 4785 6374, Mob 0439 348 739. MARK PATTERSON Phone 0458 402 166 or (02) 6947 3852. LAURIE ROSETTA 20 River Rd, Walwa VIC 3709. Phone 0488 093 674. LINDSAY ROSETTA 2010 Mayrung Rd, Mayrung NSW 2710. Ph: 0428 200 171. CHRIS SAVAS 1243 Larkins Road FINLEY NSW 2713. Phone 0499 995 882. ROSS TURNBULL Eulourie, Upper Horton, NSW 2347. Phone (02) 6783 4249. BILL WILLOUGHBY PO Box 149, Booleroo Centre, SA. 5482. Phone (08) 8658 6072. TONY WOODALL 5601 Princes Highway, Winnap VIC 3304. Phone (03) 5528 1490. DAVE ETHELL Phone 0428 775 211. www.dephotos.com.au. MIKE KENYON 4 Kupiano Drive, Bli Bli QLD 4560. Mobile 0418 711 990. Email: mike@kenyonsportsphotos.com.au, Web: www.kenyonsportsphotos.com.au. JOANNE FISHER 387 Paynters Creek Rd, Nambour, QLD 4560. Ph. (07) 5476 4424. LEANNE KENNY P.O. Box 2291, Emerald QLD 4720. Phone 0429 727 108. KERRY BEISIEGAL PO Box 536, Kapunda SA 5373. Phone 0409 137 504. LYNDA HARNEY 10 Gleeson Close, GRACEMERE, QLD, 4702. Mobile 0419 705 997. SARAH HOAD PO Box 531, Longreach QLD 4730. Phone 0428 893 109. SHARON MCGUIRE PO BOX 33, Taroom QLD 4420. Phone 0407 481 974, (07) 4627 3744.